Pins and needles to treat pins and needles? Acupuncture is based on an ancient and traditional Chinese Medicine that involves inserting very fine needles in under the skin of your body. It is used as an alternative therapy to treat a range of illnesses and conditions. 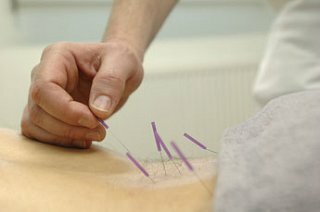 Us Physiotherapists sometimes use a similar technique called ‘dry needling’ which is based on the principles of Acupuncture but adapted for their clinical treatment programs. Sometimes, my patients ask “Should I try Acupuncture?” to treat chronic back pain and is it effective as an alternative to taking pain relief medication. These are hard questions to answer and the topic is well debated in the medical world! There are a range of studies published on the effectiveness of acupuncture as a treatment for back pain. Generally, they conclude there is insufficient evidence to show how effective Acupuncture is, but more research is needed, particularly in the treatment of lower back pain. Considering this, along with own observations from the patients I see in my physiotherapy practice, I would not generally recommend acupuncture to be an effective sole course of treatment of mechanical back pain – at least in cases that I would typically see on a daily basis. However, I do not dismiss it completely - I find that ‘needling’ can be effective as part of a management approach to back pain, and I do use a similar technique known as Dry Needling (a western adaptation of Acupuncture that focuses on releasing ‘trigger points’ as opposed to acupoints). In certain cases, I use Dry Needling in conjunction with manual therapy and strengthening exercises to successfully treat back pain. There are two areas where I find Dry Needling to be effective. Firstly, it appears to work better on nociceptive pain (pain coming from injury and peripheral disease), more so than neuropathic pain (pain arising from within the nervous system). Secondly, Dry Needling and Acupuncture can be effective in the relief of acute (early) stages of back pain where pain is at its most severe. This is due to the effect it has on helping ease muscle spasm, allowing you to move more easily with less pain. It can also help to relax the nervous system eases tension and helps sleeping - this is important because it is while we sleep that greatest healing can occur. With regard to Acupuncture as an alternative to medication for back pain, again, I would highlight the important point of seeking professional medical advice first, to get an early diagnosis in the management of your back pain. If your therapist correctly determines that your condition involves acute nociceptive pain, then Accupuncture may be of value and may reduce your dependency on medication to control pain, and I would see this as having a positive effect on the general heath and function of a back pain patient. To summarise, I see potential in using Acupuncture to treat back pain in certain cases. However, in my experience, it should be used appropriately only in the management of certain types of back conditions - and by management I mean as part of an overall treatment strategy that generally involves The best course of action I would recommend that you first consult a medically qualified therapist and diagnose the cause of your back pain. Then talk about whether ‘needling’ is a suitable option to treat your condition. If so, then ensure that the Accupuncturist you choose is medically qualified and experienced to treat the condition.